NHL commissioner Gary Bettman is interviewed before the 2014 Coors Light NHL Stadium Series between the Anaheim Ducks and Los Angeles Kings at Dodger Stadium. Is more outdoor hockey in Southern California a possibility? 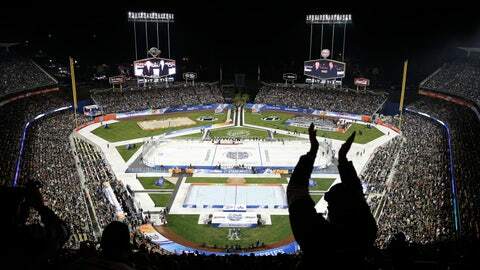 Maybe, but NHL commissioner Gary Bettman, after saying he was thrilled with the Kings-Ducks production Saturday night at Dodger Stadium, wasn’t quite ready to jump on board with another outdoor game in L.A. or Anaheim. "The answer is, as good as we feel about things, we need more than five minutes to take a breath," Bettman said after the Ducks defeated the Kings 3-0. "But clearly, what was accomplished tonight gives us an opportunity to reflect on all the possibilities, and we’re excited about that." The game was equal parts Hollywood and sport. The rock band KISS performed before the game and during the first intermission. Beach volleyball and inline hockey games were played between periods. The game ended with fireworks. Was it all a little too much? "No," Bettman said. "It was a lot of fun, and people in the stands thought it was a lot of fun. It looked great on television. It was, in every sense of the word, a Hollywood production. What better way to do an event like this than in Southern California?" It was, in every sense, an L.A. kind of night. The temperature was 63 degrees, and there wasn’t a chill in the air. It might as well have been an early season Dodgers game. Compare that to frigid New York, where the NHL’s Stadium Series continues Sunday at Yankee Stadium between the New York Rangers and New Jersey Devils. It’s expected to be 15 degrees. 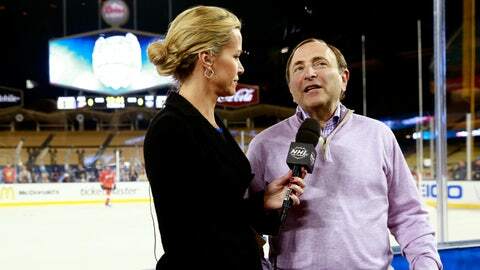 Bettman warned anyone attending that game to "put on some long underwear. It’s going to be about 70 degrees cooler than it is here." Even with the mild weather, Bettman wasn’t prepared to offer another game to the area. At the suggestion that the Kings and Ducks could host outdoor games on an annual basis, he hesitated. "We have lots of teams that want games, and after tonight, even more than we’ve been hearing from are going to want games," he said. "There’s only so many we’re capable of putting on. But we’re going to look at all the possibilities." Still, he clearly seemed thrilled at the results of the league’s first outdoor game in a warm-weather city. "In terms of everything we hoped and dreamed of in Southern California, tonight met out expectations," he said. "But more importantly, watching the crowd reaction, it’s clear there were lots of enthused and excited hockey fans in Southern California. And that’s what this is all about."